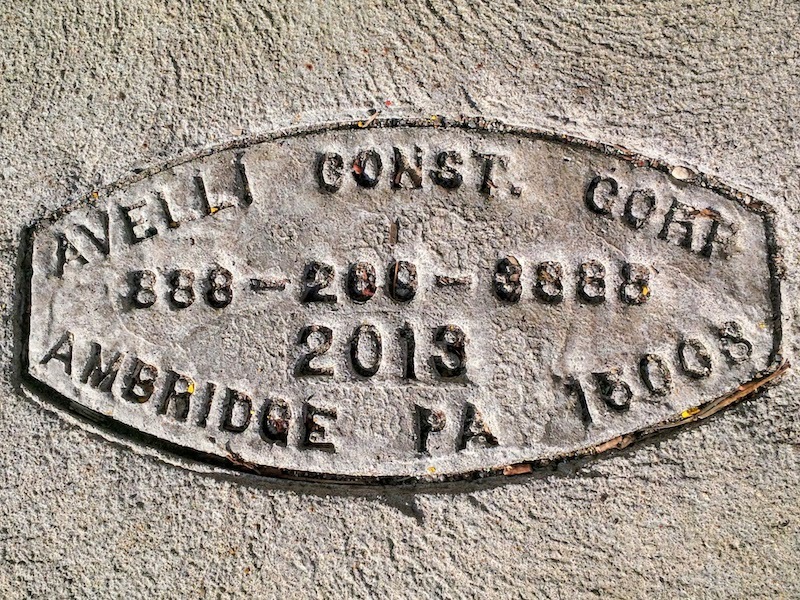 Editor’s note: our Easter special on the pursuit of figurative urban “egg hunts” generated a great suggestion from reader Larry Kramer: “OK, here’s one for intrepid city walkers: mason stamps. 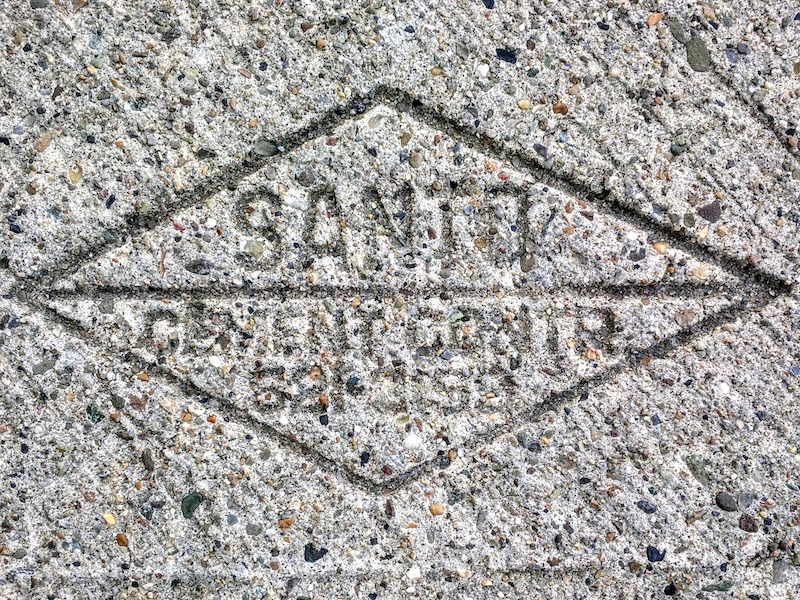 You know, the embedded names in a sidewalk advertising the contractor that poured it.” We liked Larry’s idea so much we asked him to pen a piece for The Orbit. Photos and text by guest blogger Larry Kramer. After my wife takes an untimely header on a poorly-canted section of Lawrenceville pavement, and then a wrong step from Tender while exiting with friends after a cocktail, she cautions me that maybe we should be paying more attention to where we’re walking whilst out on the streets. Chastened, we employ the method as schooled to us by our daughter: look directly in front of our feet and then scan ahead up the block a little. Repeat, and stay safe. This seems to work and we actually find stuff we’re not looking for. There’s the random watch cap that launders up just fine and can be put to use by someone, not to mention the penny here and there which we must not stoop to pick up unless it’s positioned heads up. Then there are the virtual rewards of pavement scanning, at least to those of us who like to make lists and perhaps don’t have the most exciting lives. I’m referring to “mason stamps”. I put that term in quotes as I’m not exactly sure that’s what the masons themselves call them, and I haven’t done the necessary homework yet to find out. 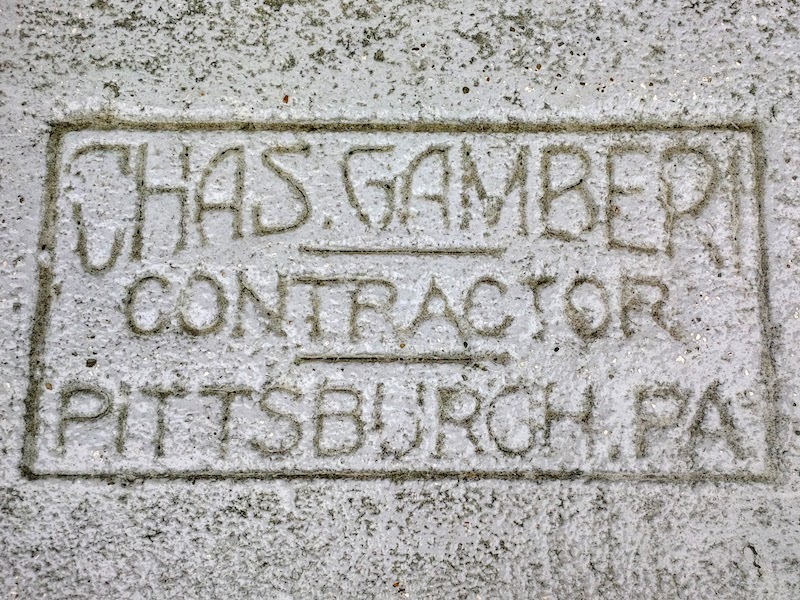 Anyway, you know what I’m talking about if you’ve spent any time at all walking the sidewalks of Pittsburgh–those imprints that only the best purveyors of concrete walks and driveways leave as a testament to their work. 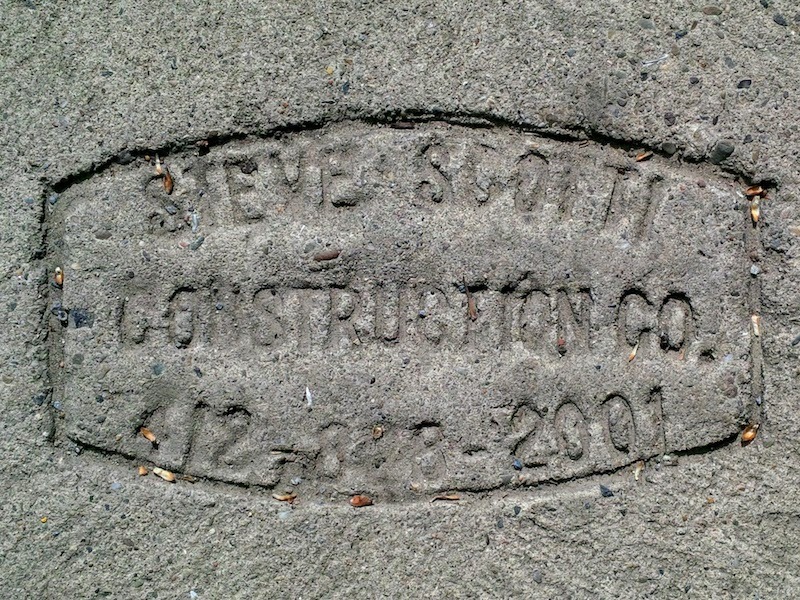 When the contractor signs their work it not only evinces their pride in it, but serves as an advertisement for future services. 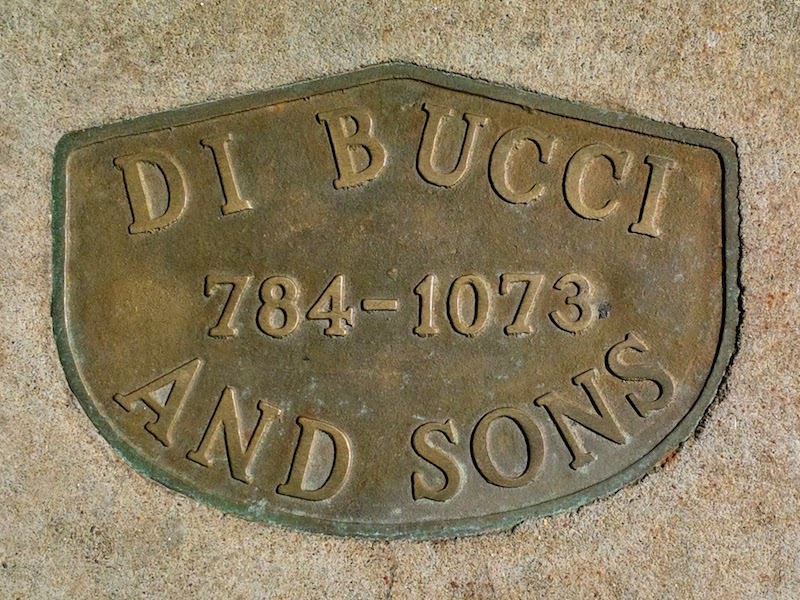 The gold standard–or maybe I should say bronze–of these mason stamps are those of Di Bucci and Sons and Pucciarelli Brothers. 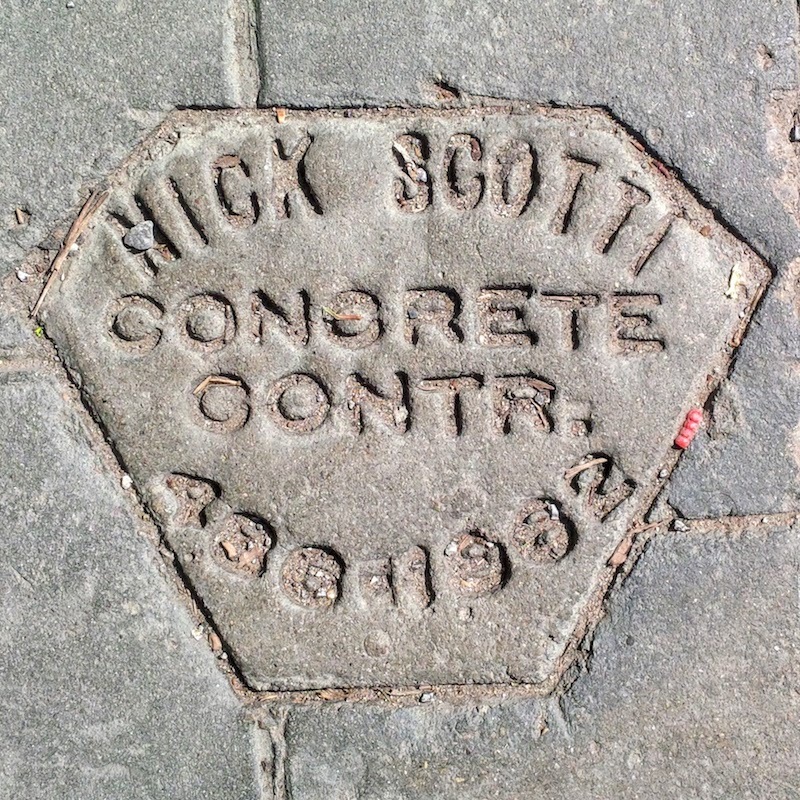 Most of the time they just stamp the concrete as others do, but if the job is somewhat extensive, they’ll actually embed a bronze plaque in the sidewalk that says for all to see that both this sidewalk and this plaque are going to last a long time. 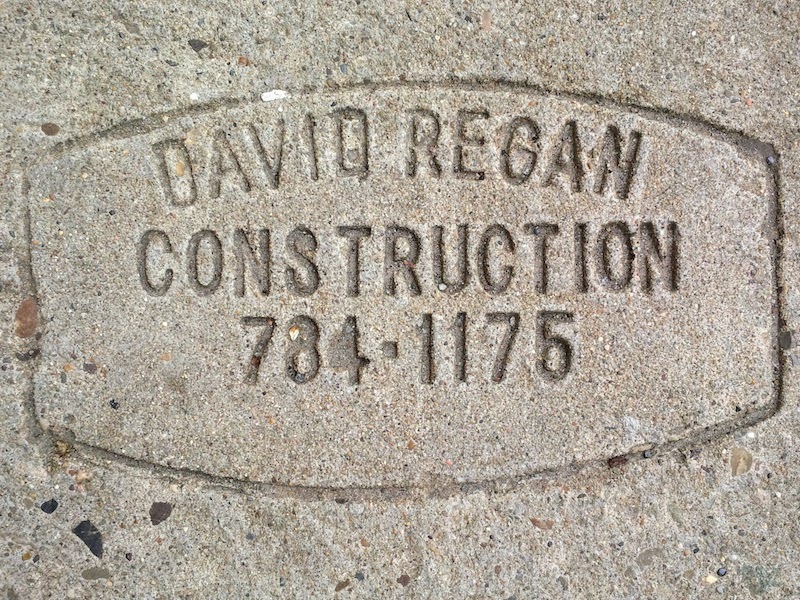 Not every mason leaves a bronze plaque behind to mark their work, but quite a few, apparently, stamp the concrete with their personal trademark. I’m not talking about their grandkids’ handprints as an amateur might do, but a deep impression of the business name and usually a phone number. Walking around the city–at least The Strip, Lawrenceville, Bloomfield, and Oakland–I became more and more aware of these, and it became a challenge to see how many I could collect. So, trusty (some may say obsolete) BlackBerry in hand, I made a concerted effort at digitally capturing all the mason stamps I could find. Not individual stamps–that could run well into the hundreds just in my wanderings–I’m talking about uniquely-named stamps. So, starting with Di Bucci and Pucciarelli, I make my way with through the ABC’s with Avelli, Baleno, and Ciriello. 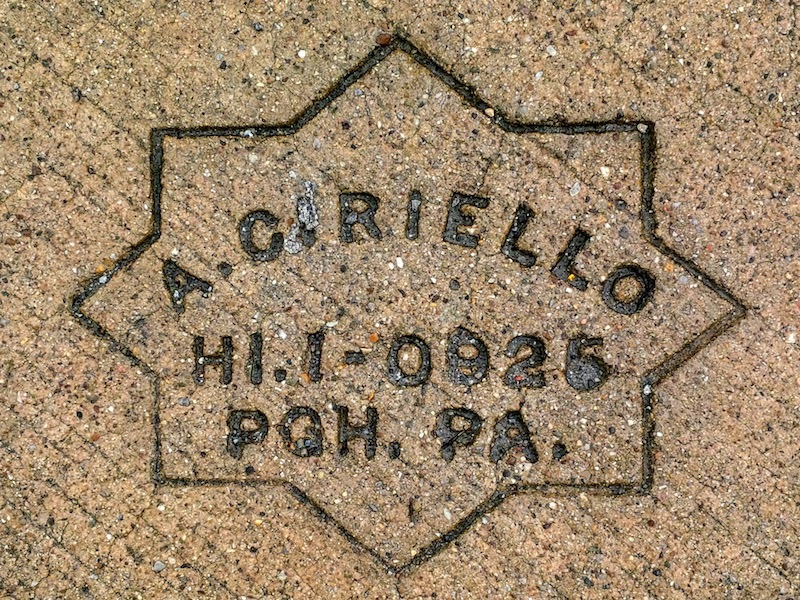 The Ciriello stamp is old. 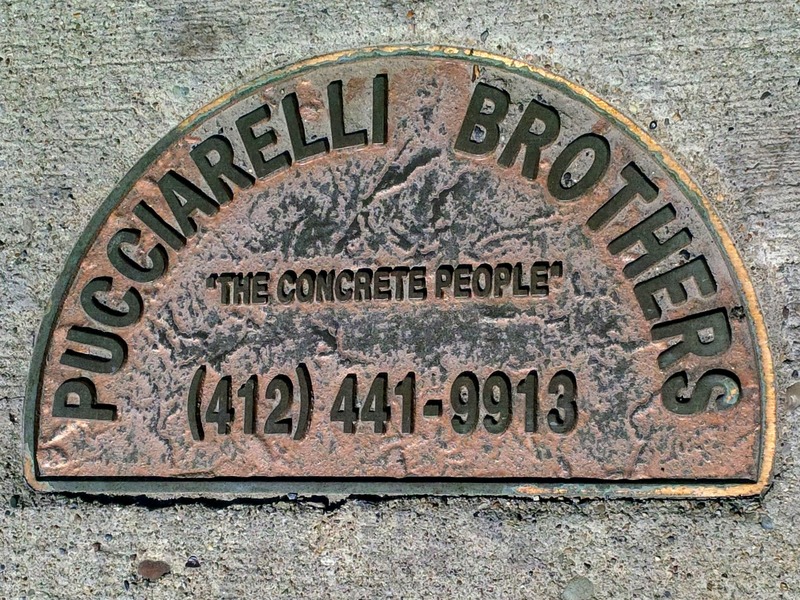 Not only is the phone number not prefixed with a 412 Area Code, but it harkens back to the days when phone number exchanges were named something. I recall the one from suburban Philadelphia of my youth as Windsor (WI) 6. Not sure what the HI stands for but older Pittsburgh residents might recall it. 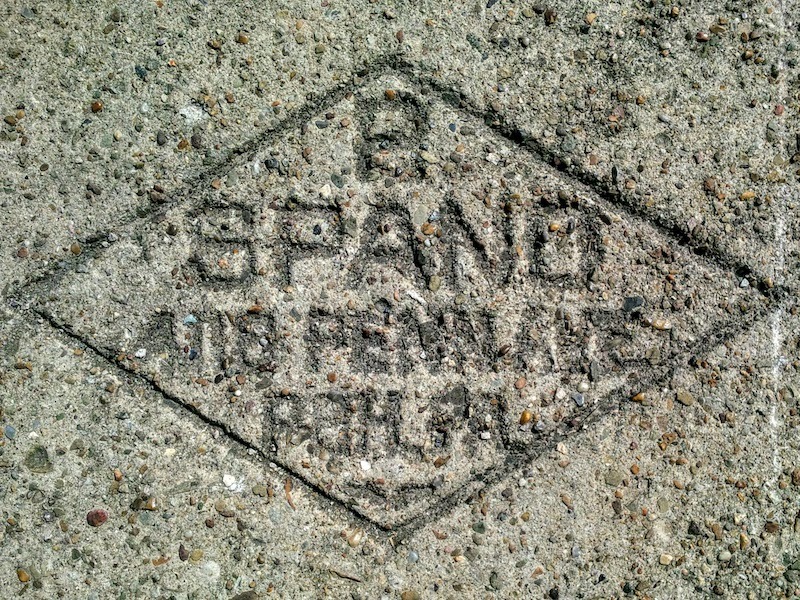 Esses can be found as my walks continue, and I start to take side streets off my well-trodden usual route, now actively in search of the elusive stamp: Santo, Scotti, Spano. 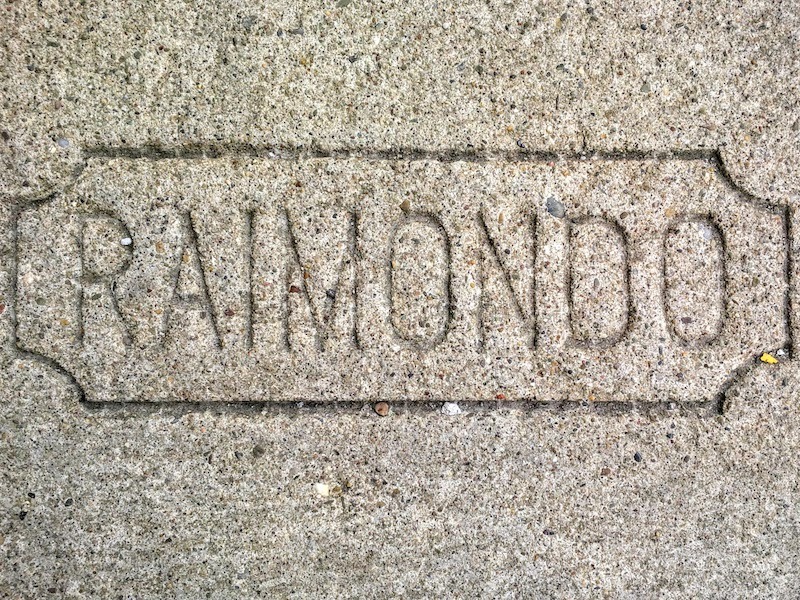 But there’s an “R” in my future as well as I chance upon a lone, lonely Raimondo in Upper Lawrenceville. I don’t know if there are others about, but this is the only one I’ve seen. At this point I’m starting to come up empty. I need to expand my territory, perhaps farther out in the East End, to Shadyside, Point Breeze, East Liberty. Who knows, Highland Park? What about an excursion beyond The River to the Southside? Something else is niggling me. I know it’s a cliché, but are all masons Italian? Apparently, not! Just as things look bleak, I find a singleton Ira G. Wilcox and a David Regan. 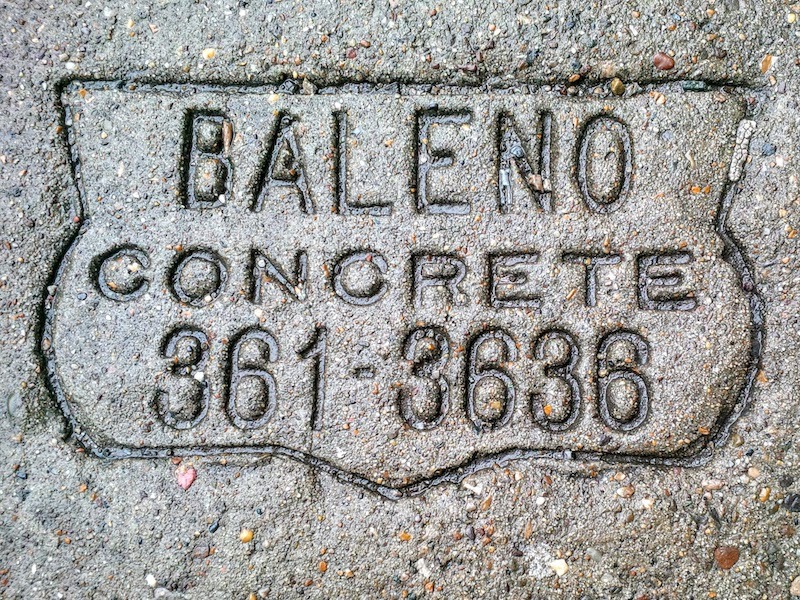 They’re in very old concrete; don’t even try Googling these contractors as they’ve been out of business for some time, but you can try finding the stamps before they lapse into indecipherability as have some I’ve come across. Walking The Strip today, I’m not even watching the pavement. It’s a Sunday and too many tourists to dodge. Wait, what’s that? A new one? Nope, just another Scotti, they’re a dime a dozen. On closer look, though, this one turns out to be different; a different format, and not Steve Scotti, this one’s Nick! The hunt goes on. I think a Southside trip is overdue. Who knows what stamps I’ll find on Carson Street? 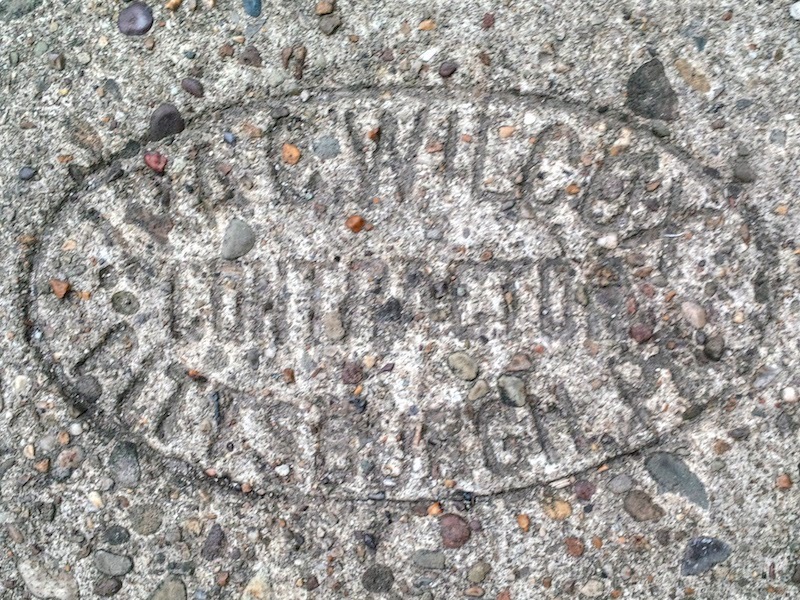 The Internet contains remarkably little information and no obvious consensus on the term, but sidewalk stamps seems to be the favorite. The historical site phone.net46.net lists Pittsburgh’s HI exchange name as “HI-land”.